SLAC and Stanford scientists have set a world record for energy storage, using a clever “yolk-shell” design to store five times more energy in the sulfur cathode of a rechargeable lithium-ion battery than is possible with today’s commercial technology. The cathode also maintained a high level of performance after 1,000 charge/discharge cycles, paving the way for new generations of lighter, longer-lasting batteries for use in portable electronics and electric vehicles. The research was led by Yi Cui, a Stanford associate professor of materials science and engineering and a member of the Stanford Institute for Materials and Energy Sciences, a SLAC/Stanford joint institute. Lithium-ion batteries work by moving lithium ions back and forth between two electrodes, the cathode and anode. Charging the battery forces the ions and electrons into the anode, creating an electrical potential that can power a wide range of devices. Discharging the battery – using it to do work – moves the ions and electrons to the cathode. Today’s lithium-ion batteries typically retain about 80 percent of their initial capacity after 500 charge/discharge cycles. For some 20 years, researchers have known that sulfur could theoretically store more lithium ions, and thus much more energy, than today’s cathode materials. 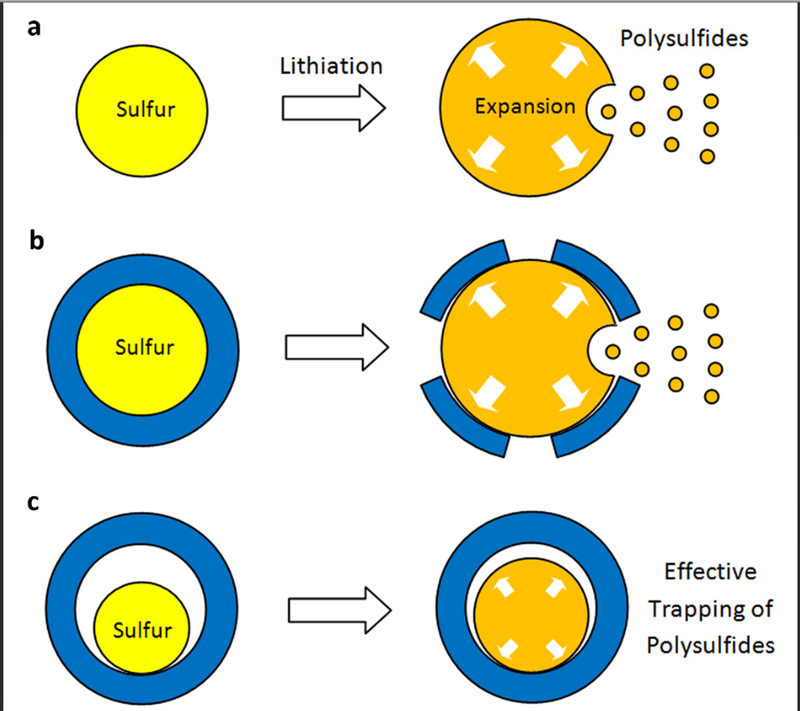 But two critical disadvantages prevented its commercial use: When lithium ions enter a sulfur cathode during discharging, they bond with sulfur atoms to create an intermediate compound that’s important for the cathode’s performance; but this compound kept dissolving, limiting the cathode’s energy-storage capacity. At the same time, the influx of ions caused the cathode to expand by about 80 percent. When scientists applied protective coatings to keep the intermediate compound from dissolving, the cathode would expand and crack the coating, rendering it useless. Cui’s innovation is a cathode made of nanoparticles, each a tiny sulfur nugget surrounded by a hard shell of porous titanium dioxide, like an egg yolk in an eggshell. Between the yolk and shell, where the egg white would be, is an empty space into which the sulfur can expand. During discharging, lithium ions pass through the shell and bind to the sulfur, which expands to fill the void but not so much as to break the shell. 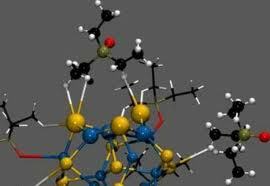 The shell, meanwhile, protects the sulfur-lithium intermediate compound from electrolyte solvent that would dissolve it. Over the past seven years, Cui’s group has demonstrated a succession of increasingly capable anodes that use silicon rather than carbon because it can store up to 10 times more charge per weight. Their most recent anode also has a yolk-shell design that retains its energy-storage capacity over 1,000 charge/discharge cycles. The group’s next step is to combine the yolk-shell sulfur cathode with a yolk-shell silicon anode to see if together they produce a high-energy, long-lasting battery. Source: From Egg-cellent World-record Battery Performance by Mike Ross. This work is detailed in the paper “Sulphur–TiO2 yolk–shell nanoarchitecture with internal void space for long-cycle lithium–sulphur batteries” by Zhi Wei Seh, Weiyang Li, Judy J. Cha, Guangyuan Zheng, Yuan Yang, Matthew T. McDowell, Po-Chun Hsu & Yi Cui. Living cells are surrounded by a membrane that tightly regulates what gets in and out of the cell. This barrier is necessary for cells to control their internal environment, but it makes it more difficult for scientists to deliver large molecules such as nanoparticles for imaging, or proteins that can reprogram them into pluripotent stem cells. Researchers from MIT have now found a safe and efficient way to get large molecules through the cell membrane, by squeezing the cells through a narrow constriction that opens up tiny, temporary holes in the membrane. Any large molecules floating outside the cell — such as RNA, proteins or nanoparticles — can slide through the membrane during this disruption. Using this technique, the researchers were able to deliver reprogramming proteins and generate induced pluripotent stem cells with a success rate 10 to 100 times better than any existing method. They also used it to deliver nanoparticles, including carbon nanotubes and quantum dots, which can be used to image cells and monitor what’s happening inside them. “It’s very useful to be able to get large molecules into cells. We thought it might be interesting if you could have a relatively simple system that could deliver many different compounds,” says Klavs Jensen, the Warren K. Lewis Professor of Chemical Engineering, professor of materials science and engineering, and a senior author of a paper describing the new device in the Proceedings of the National Academy of Sciences. Robert Langer, the David H. Koch Institute Professor at MIT, is also a senior author of the paper. Lead authors are chemical engineering graduate student Armon Sharei, Koch Institute research scientist Janet Zoldan, and chemical engineering research associate Andrea Adamo. The new MIT system appears to work for many cell types — so far, the researchers have successfully tested it with more than a dozen types, including both human and mouse cells. It also works in cells taken directly from human patients, which are usually much more difficult to manipulate than human cell lines grown specifically for lab research. The new device builds on previous work by Jensen and Langer’s labs, in which they used microinjection to force large molecules into cells as they flowed through a microfluidic device. This wasn’t as fast as the researchers would have liked, but during these studies, they discovered that when a cell is squeezed through a narrow tube, small holes open in the cell membrane, allowing nearby molecules to diffuse into the cell. To take advantage of that, the researchers built rectangular microfluidic chips, about the size of a quarter, with 40 to 70 parallel channels. 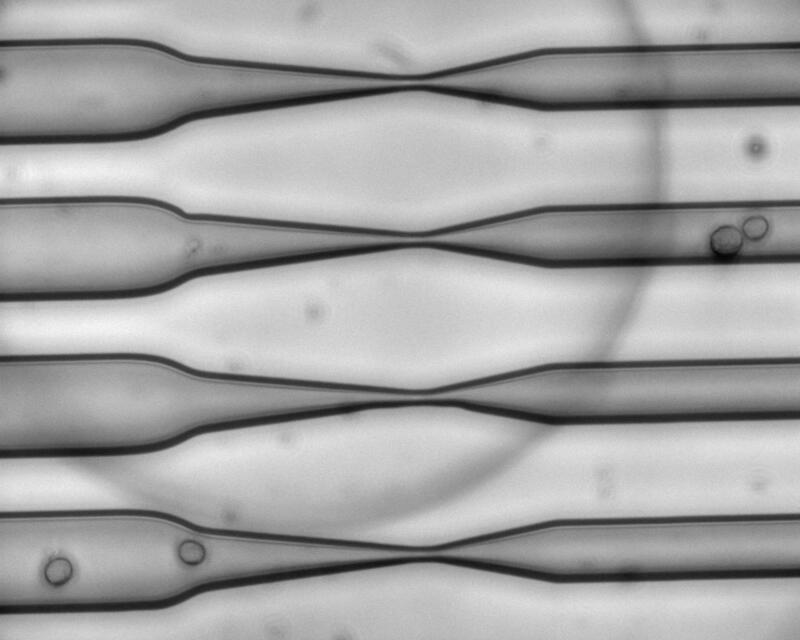 Cells are suspended in a solution with the material to be delivered and flowed through the channel at high speed — about one meter per second. Halfway through the channel, the cells pass through a constriction about 30 to 80 percent smaller than the cells’ diameter. The cells don’t suffer any irreparable damage, and they maintain their normal functions after the treatment. The research team is now further pursuing stem cell manipulation, which holds promise for treating a wide range of diseases. They have already shown that they can transform human fibroblast cells into pluripotent stem cells, and now plan to start working on delivering the proteins needed to differentiate stem cells into specialized tissues. Another promising application is delivering quantum dots — nanoparticles made of semiconducting metals that fluoresce. These dots hold promise for labeling individual proteins or other molecules inside cells, but scientists have had trouble getting them through the cell membrane without getting trapped in endosomes. In a paper published in November, working with MIT graduate student Jungmin Lee and chemistry professor Moungi Bawendi, the researchers showed that they could get quantum dots inside human cells grown in the lab, without the particles becoming confined in endosomes or clumping together. They are now working on getting the dots to tag specific proteins inside the cells. The researchers are also exploring the possibility of using the new system for vaccination. In theory, scientists could remove immune cells from a patient, run them through the microfluidic device and expose them to a viral protein, and then put them back in the patient. Once inside, the cells could provoke an immune response that would confer immunity against the target viral protein. Jan. 21, 2013 — Scientists at CSIRO and RMIT University have produced a new two-dimensional material that could revolutionise the electronics market, making “nano” more than just a marketing term. The material — made up of layers of crystal known as molybdenum oxides — has unique properties that encourage the free flow of electrons at ultra-high speeds. The CSIRO’s Dr Serge Zhuiykov said the new nano-material was made up of layered sheets — similar to graphite layers that make up a pencil’s core. 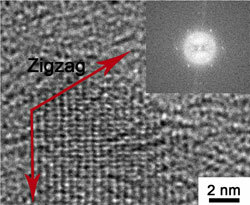 “Within these layers, electrons are able to zip through at high speeds with minimal scattering,” Dr Zhuiykov said. RMIT’s Professor Kourosh Kalantar-zadeh said the researchers were able to remove “road blocks” that could obstruct the electrons, an essential step for the development of high-speed electronics. “Instead of scattering when they hit road blocks, as they would in conventional materials, they can simply pass through this new material and get through the structure faster,” Professor Kalantar-zadeh said. “Quite simply, if electrons can pass through a structure quicker, we can build devices that are smaller and transfer data at much higher speeds. In the paper titled ‘Enhanced Charge Carrier Mobility in Two-Dimensional High Dielectric Molybdenum Oxide,’ the researchers describe how they used a process known as “exfoliation” to create layers of the material ~11 nm thick. The result was electron mobility values of >1,100 cm2/Vs — exceeding the current industry standard for low dimensional silicon. The work, with RMIT doctoral researcher Sivacarendran Balendhran as the lead author, was supported by the CSIRO Sensors and Sensor Networks Transformational Capability Platform and the CSIRO Materials Science and Engineering Division. It was also a result of collaboration between researchers from Monash University, University of California — Los Angeles (UCLA), CSIRO, Massachusetts Institute of Technology (MIT) and RMIT. Despite a tough market leading to widespread cost reductions and negative returns for many operators in the photovoltaic sector in 2012, solar technology nonetheless took major strides and achieved a number of landmark breakthroughs in key research areas. In materials research, the North Carolina State University (NCSU) in Raleigh, North Carolina used cutting-edge nanotechnology to develop slimmer and more affordable solar cells. The cells are comprised of sandwiched nanostructures which not only cut down on material usage and expenditures but also improve solar absorption and raise conversion efficiency. 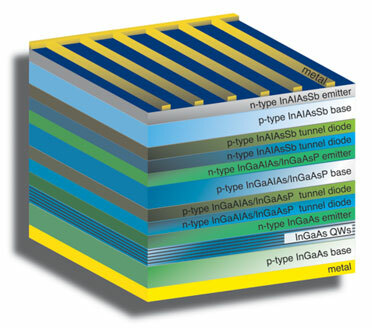 As an added bonus, the manufacturing processes for the new technology are compatible with techniques currently employed throughout the industry for the production of thin-film solar cells. In terms of government-funded initiatives, the National Renewable Energy Laboratory (NREL), a research arm of the US Department of Energy, teamed up with Natcore Technology to create the most absorbent solar cell ever devised, capable of capturing some 99.7 per cent of available sunlight. The new technology resulting from this collaborative effort between the government and private sectors could reduce the cost of solar cells by around two to three per cent while lifting energy output by up to 10 per cent. 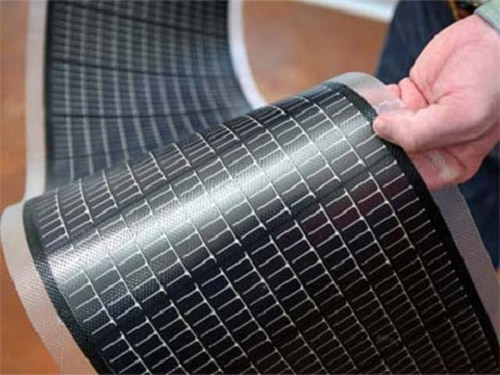 The black silicon used for the cells is also far cheaper than standard anti-reflection technologies. 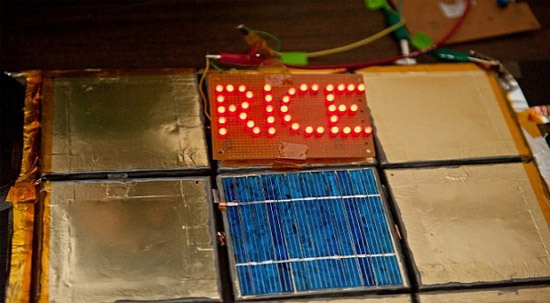 A key area of research for 2012 was improved storage techniques for renewable energies, with scientists from Houston’s Rice University in Texas developing a remarkable “paintable” battery which can be applied to any tractable surface. The rechargeable battery opens a new vista of possibilities for the convenient storage of solar energy. The new technology could potentially be applied to the cheap, mass manufacture of thin-film solar cells by using flexible substrates to “print” the devices in a process akin to that traditionally employed for the production of newspapers. Philadelphia, PA and Manchester, UK,January 23, 2013 – Dow Electronic Materials, a business unit of The Dow Chemical Company (NYSE: DOW) and Nanoco Group plc (AIM: NANO) today announced they have entered into a global licensing agreement for Nanoco’s cadmium-free quantum dot technology. Under the terms of the agreement, Dow Electronic Materials will have exclusive worldwide rights for the sale, marketing and manufacture of Nanoco’s cadmium-free quantum dots for use in electronic displays. The agreement brings together Nanoco’s world-leading technology with Dow’s large-scale manufacturing capability and well-established sales, marketing and distribution network. Dow Electronic Materials is already a major supplier of critical electronic materials to the global display industry. The financial details of the agreement are not being disclosed though Nanoco will receive royalty payments related to Dow’s sales of cadmium-free quantum dots. Nanoco will continue to provide any technology advances to its cadmium-free quantum dot technology throughout the lifetime of the agreement and participate with Dow in the marketing and technical support of these materials. Dow intends to build production capacity in Asia where it has extensive manufacturing capabilities to supply high-performance materials to its customers in the display and semiconductor-related segments. Full commercial production is expected to begin in the first half of 2014. 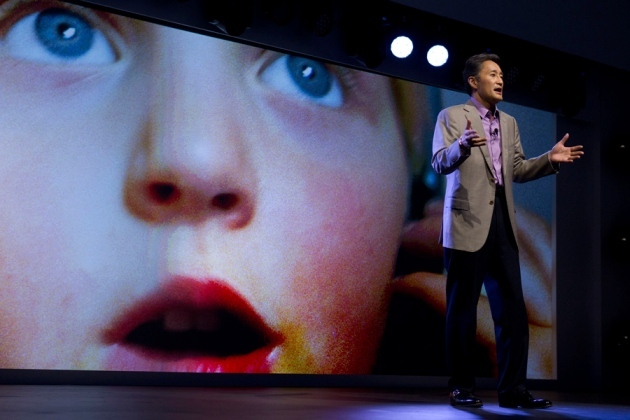 Sony has announced that it will embed quantum dots in its latest flat-screen televisions. Live from your living room, in super­saturated colour: it’s the quantum-dot TV! Researchers working with nanoscale fluorescent particles called quantum dots have long predicted groundbreaking achievements, such as ultra-efficient light-emitting diodes (LEDs) and solar cells, but the technology has found mainly niche applications. That could change with the announcement last week that QD Vision, based in Lexington, Massachusetts, would supply Sony Corporation of Tokyo with quantum dots for flat-screen televisions that will transmit more richly coloured images than other TVs on the market. Demand for quantum-dot displays, say industry watchers, could benefit quantum-dot companies, bring down the price of these nanomaterials and boost other applications that have stalled. “Displays are a potential market that could help quantum-dot companies find traction,” says Jonathan Melnick, an analyst at Lux Research in Boston, Massachusetts. Quantum dots are crystals about 10 nano­metres in diameter, made from a semiconductor material, commonly cadmium selenide. They are so tiny that their shape and size affect the quantum properties of their electrons, in particular their energy gap — the energy needed to kick electrons into a higher-energy band — which determines the colour of light that the mater­ial can emit. Whereas a bulk semiconductor is limited to emitting a single colour of light, researchers can tune the precise colour a quantum dot will absorb and re-emit by tailoring its size. Discovered in 1981, quantum dots did not find applications until 2002. That was when the Quantum Dot Corporation of Hayward, California, began selling them to cell biologists, who prize them as fluorescent imaging labels for proteins and other biological molecules. As recently as 2010, the biomedical sector was responsible for US$48 million of $67 million in total quantum-dot revenues, according to BCC Research of Wellesley, Massachusetts. Quantum dots have shown promise for electronics, too — for example in solar cells, in which a mix of quantum dots tuned to absorb different wavelengths of light could capture more of the energy in the solar spectrum. But one hurdle to their exploitation was their temperature sensitivity. Near the backlight of a liquid-crystal display (LCD), for example, temperatures can be around 100 °C. At this temperature, the dots lose efficiency and up to half of their brightness, says QD Vision co-founder and chief technology officer Seth Coe-Sullivan. He says that the company spent a long time tuning the chemistry of its quantum dots to make them stable at higher temperatures. His optimism will be tested this spring with the company’s quantum-dot debut in Sony LCD televisions, to be sold under the Tri­luminos brand name. The contrast with today’s flat screens begins with the light source. Conventional LCDs use a high-intensity blue LED backlight whose glow is converted by a phosphor coating to create a broadband, white light used to make the moving TV images. The new Triluminos tele­visions instead pair an uncoated blue LED with a thin glass tube filled with quantum dots. Two kinds of quantum dots in the tube absorb some of the blue light from the backlight and re-emit it as pure red andgreen light. The resulting white light is more intense at the wavelengths of these three specific colours than the white light made by a phosphor-coated LED, so that more colour comes through in the images. Another quantum-dot company, Nanosys of Palo Alto, California, is providing 3M of St Paul, Minnesota, with material for a similar product. 3M will make a polymer film seeded with quantum dots that does the same jobas QD Vision’s glass tube. The film is layered between the LCD’s stack of light filters, diffusers and polarizers, and similarly converts raw blue light into white light made up of pure colours. Nanosys and 3M announced their partnership in June 2012, but have not yet named any customers. BCC predicts that, by 2015, optoelectronics, including display components, will make up $310 million of a total $666 million in quantum-dot revenues. Melnick says that these numbers might be overly optimistic, because quantum dots remain expensive. “Even on the low end, they still cost in the hundreds of dollars per gram, and range up to $10,000 per gram,” he says. But demand from 3M and Sony could help to bring prices down. Although neither QD Vision nor Nanosys would comment on the volume of material they expect to make this year, or their selling price, both say that they are scaling up their manufacturing volume. Bawendi is not surprised that it took quantum dots so long to find their footing. “You could argue that 30 years is about the right amount of time from fundamental discovery to applications,” he says. Yale University scientists have found a way to observe quantum information while preserving its integrity, an achievement that offers researchers greater control in the volatile realm of quantum mechanics and greatly improves the prospects of quantum computing. Quantum computers would be exponentially faster than the most powerful computers of today. In quantum systems, microscopic units called qubits represent information. Qubits can assume either of two states — “0” or “1” — or both simultaneously. Correctly recognizing, interpreting, and tracking their state is necessary for quantum computing. However, the act of monitoring them usually damages their information content. 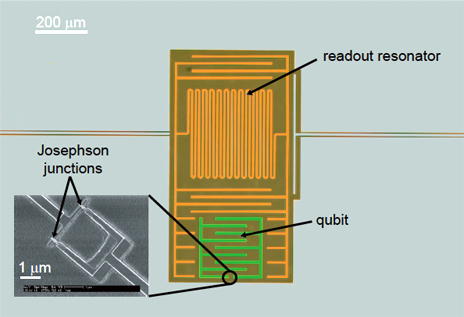 The Yale physicists successfully devised a new, non-destructive measurement system for observing, tracking and documenting all changes in a qubit’s state, thus preserving the qubit’s informational value. In principle, the scientists said, this should allow them to monitor the qubit’s state in order to correct for random errors. An innovation by Yale University physicists offers scientists greater control in the volatile realm of quantum mechanics and greatly improves the prospects of quantum computing. Quantum computers would be exponentially faster than the most powerful computers oftoday. The Yale physicists successfully measured one qubit. The challenge ahead is to measure and control many at once, and the team is developing ultra-fast digital electronics for this purpose. “We are on the threshold between the ability to measure and control one or two qubits, and many,” Hatridge said. Other authors of the paper are S. Shankar, M. Mirrahimi, F. Schackert, K. Geerlings, T. Brecht, K.M. Sliwa, B. Abdo, L. Frunzio, S.M. Girvin, and R.J. Schoelkopf. Support for the research was provided by the National Science Foundation, the United States Army Research Office, the Intelligence Advanced Research Projects Activity, the Agence National de Recherche, and the College de France.